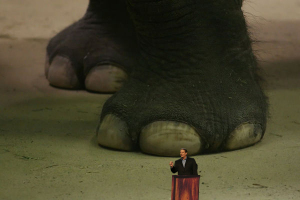 Al Gore's hypocrisy - It Floats! He calls it "Bio-Solar One." The boat supposedly runs entirely off solar power and biodiesel-powered engines. Yet the fellow who snapped the photos of the boat observed that the 100 ft. behemoth was mysteriously plugged into power outlets at the dock. Hmmmmm. 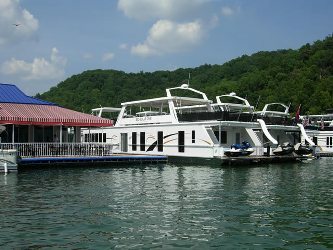 The boat's manufacturer, Bill Austin of Sparta, TN, claims that at full cruise speed, the boat only uses 2 gallons of fuel per hour, and that Gore can cruise for "two or three years" on the boat's 500 gallon tank. But there are a few problems ... first, no one anywhere near the boat dock sells biodiesel -- so where is Gore going to get it, particularly if he runs low on fuel while the boat is out of the dock? Secondly, 2 gallons per hour? C'mon! Was Gore so stupid that he fell for such a nonsensical claim without researching it, or does he think that we are so stupid that we won't research it ourselves -- a much smaller 60 foot houseboat burns approximately 10 gallons of fuel per hour. It's also a good bet that the Seadoo on the back of the boat burns regular gasoline. So add this to the energy-sucking mansion, the fleet of Lincoln Towncar limousines left idling during speeches, and the thousands of miles of travel in private jets that Gore apparently has no problem with. As others have said, I'll believe there's a carbon crisis when Al Gore and his disciples start acting like there is one. Now seems like a good time to talk about the inconsistencies and errors in the climate models used by global warming alarmists to "prove" their theories about man-made global warming. 1) One of the most compelling papers on the subject, published in 1998, introduced a graph of mean temperature changes over the past millennium that seemed to indicate a very sharp rise in global temperatures during the 20th century. The shape of the graph, an essentially steady trend with a sharp rise at the end, gave rise to the nickname "hockey stick." Further analysis of the data and the computer simulation revealed that there was a massive amount of error in the final results. The paper's authors issued a subsequent statement explaining that the purpose of the study was to illustrate that better data was needed, and that the results of their work had simply been misunderstood. 2) Another oft-cited study was published by the Goddard Institute for Space Studies (GISS) under the leadership of NASA. This study purported to show that the five of the ten hottest years on record for the United States occurred between 1990 and 2006. Well, Steven McIntyre, the scientist who first doubted the validity of the "hockey stick" graph, has done it again. He has uncovered problems with the temperature data used by GISS, as well as errors in their calculations. While McIntyre's findings cannot be extrapolated to worldwide data, they certainly suggest that US weather data is far from perfect. NASA quietly republished their findings, crediting McIntyre with the correction -- but they failed to issue a press release or otherwise notify the US news media. Gosh, you'd think that something like this would be considered muy importante. But wait, there's more. In this story published yesterday, climatologists admit that, "Existing global climate computer models tend to underestimate the effects of natural forces on climate change..."
In other words -- nature behaves unpredictably enough to render climate predictions inaccurate, even for time spans as short as two years. So scientists have to continually tweak the forecasts by comparing the results of their models with real-world data. Our data collection methods are flawed, even here in the US, which has the most accurate system of collecting weather measurements. That being the case, how well can we trust data from nations who have less quality control than we do? Our computer models are crude and filled with errors. For example, the original "hockey stick" program threw out data that it didn't like. And get this -- until Steven McIntyre published his analysis of the GISS/NASA study, NASA had declined to make both its raw data and its computational methods available for public scrutiny. Absolutely amazing. There is ample evidence that solar activity contributes significantly to climate fluxuations. Smoke and other aerosols also contribute significantly. Yet current computer models often factor in little or no corrections for these effects, chiefly due to the fact that both phenomena are far from being well understood. If climatologists have difficulty forecasting weather patterns only two years in advance, then how can we trust them to make predictions 50, 100, or 300 years into the future? Much of the scare information in An Inconvenient Truth was based on the hockey stick chart and the original GISS/NASA temperature survey. 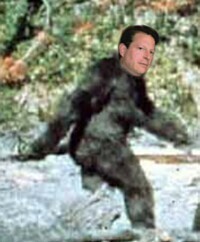 How reliable is Al Gore's message now, since we know that both studies were flawed? As I have written before, the Earth's climate is a complex nonlinear dynamic system that is virtually impossible to model. Fluxuations in the earth's climate occur constantly. But I have yet to see good scientific proof, peer-reviewed and reproduced within good error limits, that conclusively proves that the current warming trend is entirely the fault of man. CFL's - an environmental doomsday machine? In a recent Washington Times op-ed, Steven Milloy, publisher of Junkscience.com, tells the story of Brandy Bridges, who had the misfortune of breaking a mercury-containing compact fluorescent bulb in her home and ended up with a $2000 cleanup bill from a local environmental remediation firm. Ms. Bridges tale exposes a serious problem with existing environmental regulations. Currently mercury is considered a hazardous pollutant and is strictly regulated by the EPA and state environmental agencies. Mercury emissions by industry are strictly monitored, particularly where employee exposure is involved. The allowable amount of mercury in air, water, or soil is extremely minute. So if you break a bulb in your home, have you just exposed your family to a harmful toxic pollutant, all in the name of slowing down global warming? Technically yes, but unless you break a lot of bulbs over a short period of time, there should be no harmful effects. In other words, no one in your family should become "mad as a hatter." 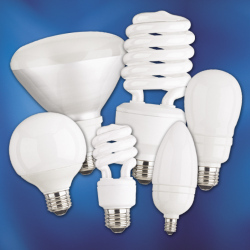 In his op-ed, Milloy also notes that if these bulbs are disposed in regular trash, they will contaminate landfills, possibly resulting in expensive environmental cleanups and endless litigation. And it appears that the government has yet to figure out a disposal system for all the CFL's that will need to be replaced in five years or so. Perhaps its time for the EPA to take a second look at mercury levels defined in the CERCLA Superfund law. On the other hand, benzene -- the primary component of gasoline -- is a CDC class A carcinogen, yet we are not required to wear a haz-mat suit or use a respirator when we pump gasoline into our cars. Despite its dangers, we have lived with gasoline in our everyday lives for a century. The public outcry against excessive requirements for the handling of gasoline would be enormous, so much so that such requirements would probably be pointless. Maybe the same thing will happen with all those mercury-containing CFL's. ADDED: Chaz at Dustbury.com corrected my mistake about benzene. It is not the primary component of gasoline, but it is a primary indicator of environmental contamination by gasoline or refined hydrocarbons. The primary components of gasoline are hexane, heptane, and octane. Benzene is about 1% of gasoline. Still, gasoline is nasty stuff. The UN Intergovernmental Panel on Climate Change released an interim summary last month of its upcoming behemoth report, Climate Change 2007. The IPCC's Summary for Policymakers (PDF download) states that the panel is "90% certain" that "human-generated greenhouse gases account for most of the global rise in temperatures over the past half-century." If you are familiar with analytical scientific methods, then you know that 90% certainty in your results is not very good. It means that only 90% of your measurements are falling within an acceptable range, and that your work has a 10 percent margin of error, which is huge. We would never put faith in an opinion poll with a 10 percent margin of error because when the measured results differed by less than ten percent, the results of the poll would be useless. Most analytical methods are based on a 95% confidence level. Methods for extremely precise measurements are usually based on a confidence interval that yields a 99% certainty. Feynman also believed in the principle of honesty in science. In his view, science was crippled without "a kind of scientific integrity, a principle of scientific thought that corresponds to...a kind of leaning over backwards. For example, if you’re doing an experiment, you should report everything that you think might make it invalid — not only what you think is right about it." Until global warming gurus admit that they have not been forthright about all the potential problems inherent in their theories and climate models, they are not doing honest science. And if we are not careful, we will be footing the bill for their dishonesty for a very long time. This week we learned that Al and Tipper Gore live in a mansion five times the size of the average American home which, every year, uses the equivalent of ten times the amount of energy that is consumed by the average American home. That's quite a "carbon footprint," especially for the man many consider to be the Moses of Gaia worship. In his defense, Gore's handlers argued that he pays a monthly surcharge for electricity supposedly supplied by "green" power generation systems, and that he also pays additional money in "carbon offsets" which supports the planting of trees and research into alternative energy sources. The Lumberjacks also note (in their new blog masthead) that this sort of behavior is the equivalent of pigging out at the dessert bar and then hiring someone else to diet for you. And this isn't the first time that Gore has been caught with his environmental britches down: his interior redesign of the Vice President's mansion included rare old-growth hardwoods; his family trust owned a six-figure portfolio of Occidental Petrolem stock, and also controlled land that was used for a pollution-spewing zinc mine. Of course this all raises a rather problematic question: as an annointed prophet for the religion of environmentalism, should we do as Gore commands, or follow the way he lives? ADDED (and this is a biggie): Bill Hobbs reports that Gore is buying his carbon offsets from a company that he owns. He is buying them from himself, or rather he has invented a clever way of investing in his own company that circumvents the corporate books. Why are people still listening to Al Gore? I cringe every time I remember that this man was almost our president. Thoughts on Al Gore's "An Inconvenient Truth"
I've been putting off writing about Al Gore's movie An Inconvenient Truth, but this story published by the AP just pushed me over the cliff. Washington - The nation's top climate scientists are giving "An Inconvenient Truth," Al Gore's documentary on global warming, five stars for accuracy. The former vice president's movie — replete with the prospect of a flooded New York City, an inundated Florida, more and nastier hurricanes, worsening droughts, retreating glaciers and disappearing ice sheets — mostly got the science right, said all 19 climate scientists who had seen the movie or read the book and answered questions from The Associated Press. This is a news story? I'd give it five stars as a pure propaganda piece. They also challenged Gore's over-reliance on the questionable "hockey-stick" climate model as well as several other controversial claims made in the movie. Then there is the excellent JunkScience.com, which has detailed rebuttals of virtually all the claims made in Gore's movie.